The Yellow / Orange / Red warning scheme initiated last year is retained as a banner that will appear at the top of any day’s Log entry where there have been Environment Quality concerns. A Red warning would relate to such issues as CyanoBlooms (‘blue-green algal blooms’) which may necessitate a Swimming Ban and special care for Dogs and other animals. Hopefully these will not recur this year but we need to be prepared in light of problems in November 2013 and 2014. Orange Warnings relate to contamination where there appears little possibility of harm or health risk but where a condition may be damaging to wildlife in the area or limit the amenity value of the Lake. Yellow warnings will solely describe situations which may be unsightly and which should be eliminated. We anticipate there may be several Yellow Bars in the Logs below during 2015! 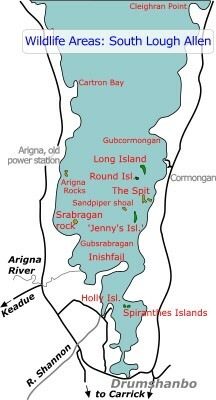 Corry Strand to Yellow River and back via all the inlets and islands. Following a long cool wet and windy start to 2015, this was the first opportunity to do a boat trip around Lough Allen. Other shore based surveys and office based work has been undertaken in January and February and will be reported in those months or in Special Features. Weather and water conditions are collected for each field trip in a data sheet at the bottom of each monthly report. Today was a day of some interesting biodiversity, though not in any great quantity, but also a disturbing reminder that nothing is improving water-wise in Lough Allen. Word from Irish Water indicates that they are bound into long term contracts with the 3 main water treatment plants around the lake and can not improve the situation in regard to these plants. Widely distributed foam in isolated water bodies also points a finger at local sources, such as mechanised Septic Tanks. We have classified the water quality today as POOR with both Foam present on shore (Cormongan) and widespread scum on calm water particularly near Corry Shoal and in a wide band of water streaming from the Shannon between Gull Island and Church Island. This declined further south and further east, ie. in the Yellow River and Cleighranmore Bay area. 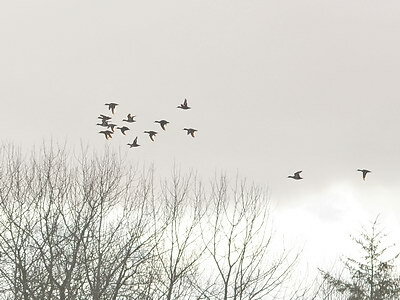 Good numbers of Teal were present in small groups in many parts of the area surveyed. A smaller group of Wigeon was seen. 12 very wild Whoopers and two potential GLAS species of waders were encountered, Lapwings and Redshanks. Lapwings have bred in this area. We have no records of Redshank breeding in recent years. A nice picture of a female Teal ‘springing’ from the water close to our boat. A large stream of persistent bubbles trailing behind the boat. As you will notice these bubbles are coming from the bow of the boat more than the engine. This photo was taken using standard parameters but photographs were not taken on a widespread or continuous basis. Such persistent bubbling, in our view, is an indication of continuing pollution. As you can see from this image today was rather a peach of a day. Calm, mainly sunny conditions, with a blue sky and matching blue water. Unfortunately at the northeast quarter of the lake things were not exactly ideal. Foam was present on Corry Strand when we launched our boat. The water was scummy as we headed south. In open water in mid lake east of Spencer Harbour there was still much persistent bubbles remaining behind the boat for considerable periods. These bubble streams are a new phenomenon but are becoming widespread around the lake. The fact that they are unnatural is borne out by the fact that we did not notice them so much in our early days boating on Lough Allen and by the fact that in certain conditions and in certain places we can still enjoy perfectly normal patterns of natural bubbles quickly breaking. An excitable male about to ‘spring’ and fly away. These birds are quite nervous and lively at this time of year. 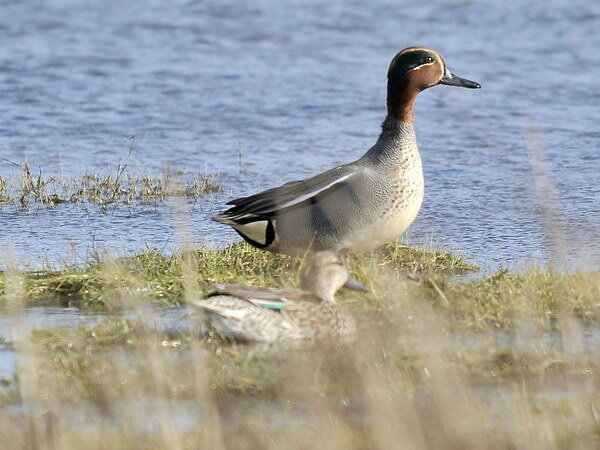 The female shown swimming is much plainer but has a distinctive green bar on the wing which distinguishes it from its American cousin, the Blue Winged Teal which is occasionally found in Ireland too. Good numbers of Teal often in small parties at Fahy, Druminalass, Rossmore etc. but congregating as a flock of 20 off Gull Island as we headed home. Obviously there could have been many more individuals in other pockets of the north end of the lake not covered today, eg. around Spencer harbour. 3 very active Goldeneye were seen flying and displaying between Druminalass and the midpoint of the lake well south of Gull Island. At this position there was much active courtship going on leading to some of lightest fluffiest down we have ever see being torn off and left behind on the very calm water. Goldeneye, of course breed in northern Europe and Russia but are seen here in Winter and form pairs and undertake courtship prior to migrating. 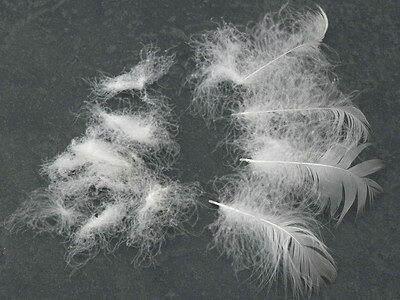 Goldeneye Feathers and Down found on Lough Allen! It was nice to see a pair of Redshank (two) feeding on the shore at Cleighran Bay. Redshank and Greenshank have been seen regularly moving through Lough Allen in between seasons. 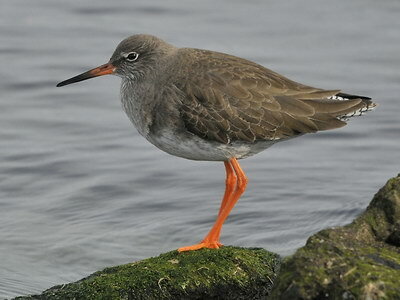 Redshank are typically regarded as seashore birds (see photo RIGHT) but do breed near Lough Allen (south of Carrick-on-Shannon) and probably sparsely elsewhere. 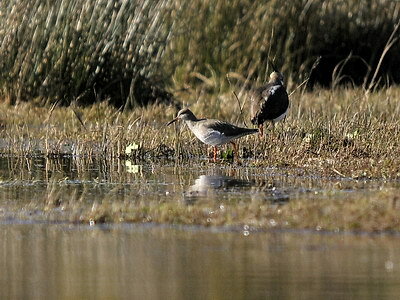 That bird behind the Redshank is a Lapwing, the only one seen today. However, this is an area where they have bred, the bird was calling out as if for a mate, and breeding of waders such as these is a conservation criteria listed under the terms of the GLAS initiative for farmers keen to preserve Natural Heritage. A nice party of 12 Whooper Swans in Druminalass. A similar number has been present in the area since November initially as two parties of 5 and 7. More Winter Ducks and Canada Geese! Glad to get out on the lake again. This time the lower half of the lake was surveyed particularly looking for wintering ducks and migratory or resident wading birds. Small dispersed numbers of Wigeon and Teal were spotted with 6 Whoopers in Mountallen Bay. Unfortunately no Lapwing, Curlew or Redshank were encountered despite looking carefully in the suitable places. Lapwing and Curlew are species which, if they could be encouraged to breed, would automatically entitle the landowner to GLAS funding from the Department of Agriculture. Lapwings and Curlew have bred recently in very small numbers. Lapwing, in particular might be encouraged to return given the right secluded and undisturbed sites. They have shown a determination to reconnoitre the area every year. Curlews are declining rapidly in Ireland and are inclined to nest in areas where they are disturbed by industrial Bog cutting. A notable species, but not a beneficial one, were Canada Geese. 6 were seen today! This species has been appearing in Lough Allen at this time of year over the past five or more seasons. They lay eggs and attempt to breed but so far do not seem to have done so successfully. The reason we describe this ‘new biodiversity’ as unwanted is because they have shown a pattern of population explosion in country Parks throughout Britain. They would not be a threat to other L. Allen wildlife as they are mainly grass feeders but they do make public areas very dirty and reduce recreational value of such places. They are also an invasive species! This was a rather quiet day in terms of plants and animals. However, water quality was good compared with the conditions observed further north on the previous day. No scum or shore based foam was observed. Our goals for this year would be to reduce visible and harmful water pollution and to encourage local landowners, especially shore or river based farmers, to identify rare and valuable species and to apply for GLAS funding to protect them. Such support might justify the removal of grazing animals from the immediate shorelines throughout the year. As far as we can identify all pollution in Lough Allen seems to come from Irish Water treatment facilities and small localised waste water systems such as the mechanised Septic Tanks. 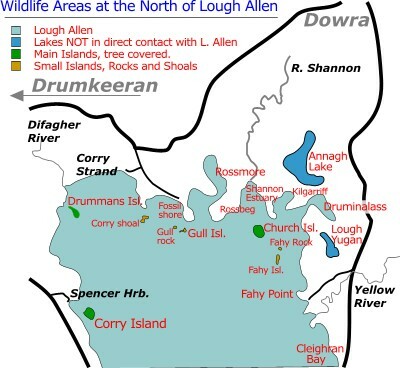 We have no evidence that animals on the shore cause significant visible or long term pollution but they do harm or destroy important parts of Lough Allen’s biodiversity found on the shore. Sun, Moon and Magic... at Lough Allen. A smile in the sky! This was a magical moment which had been predicted, appeared elusive and then, like a shy baby, suddenly breaking out with this big wide smile. It is strange when, in troubled times, something completely alien comes along to fill you with awe and joy! 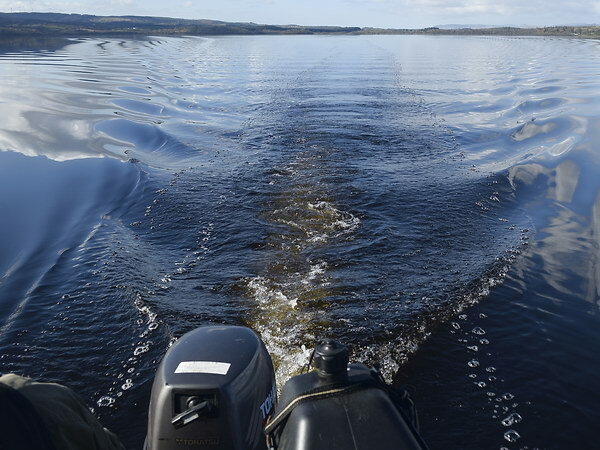 We often describe our work as monitoring the environment of Lough Allen. Maybe this is a bit outside our brief. This is a picture of the Moon (where is it?) and the Sun. But it was the clouds and their quick changing that hid the eclipse and then showed it gently through a fine shroud — so that we could actually see it safely — that really made the morning magical. 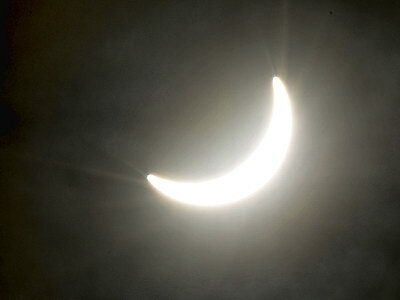 Today was the day of the much anticipated almost complete solar eclipse. We did not expect to see it and had abandoned plans to go out on Lough Allen and try and get that special shot of the obscured sun reflecting on the lake. Just as well we did; it would have been well nigh impossible and the mist and local cloud over Slieve an Iarann might have obscured the phenomenon totally. These photographs were taken behind our house and were the best of many attempts. The brown areas are denser clouds underexposed and the grey around the sun is largely blue sky but also under exposed because of the brilliance of the sun. Photographs were taken between 0915 and 0940. Following the shot shown below, Right, the sky rapidly cleared and it was impossible to observe the last of the eclipse, least of all photograph it. Moon starting to clear the Sun with striking rays appearing to emerge from the edges of the smile. 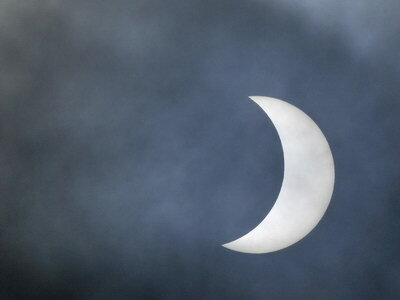 Last shot we were able to take due to a clearing sky and a larger Sun totally overwhelming our cameras. But it was one of the clearest images we got. Today, we have had the pleasure of a stunning sight into the past at Lough Allen — how people lived and how they got around the lake! Like us they had to cross rivers, funerals had to be carried, fishing undertaken, and people helped to travel. Rivers such as the Shannon still do limit easy movement on foot from one part of the lake to another. Boats such as the one found today were made and employed for all these activities. This find has been reported to National Monuments and they have visited the site. Pending their investigation of the artefact we are restricted in what we can say about it. However it is being fully recorded and aged and that information will be in the public domain soon. We have agreed to work with National Monuments to help study and conserve this canoe. So we can only publish unrecognisable photographs and keep the locality quiet for the time being. This is a large and heavy section of an Oak tree that has been worked by Man.... some time in the past! Ancient Oak Boat found in Lough Allen. This boat could have been almost as impressive as the Lurgan Canoe now preserved in the National Museum which is 1m. wide and 14m. long. That ‘canoe’ is complete with sides, has been estimated to be over 4,000 years old, and was extensively preserved and transported for display in Dublin. Details can be seen HERE. 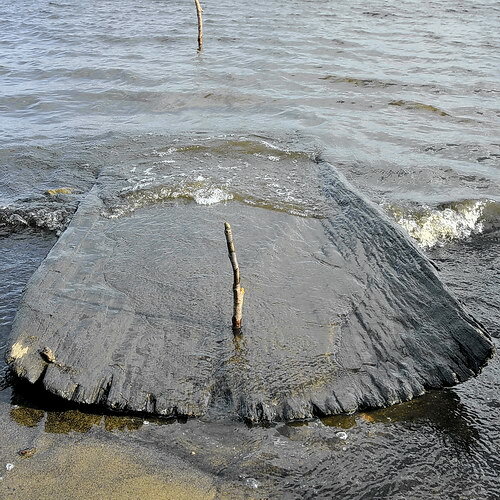 Because of the condition and the location of this recent find, National Monuments plan to study, age, and sketch the Lough Allen specimen before laying it back deeper in the lake to help naturally protect it. As best we understand, these boats were carved from a large full trunk of Oak. Carving from the top down towards the middle of the trunk to provide the flat platform we see in the picture below Left. The holes visible all along the specimen were then accurately cut to a depth of c. 13.5cm. The trunk was then turned over and the other side of the trunk chipped away until the holes were exposed. This prevented too much of the wood being carved away and the floor of the boat weakened. Clever, eh? This image shows the length of the find. The near end may have been the bow and the end in the water, slightly narrower, has been broken off. The boat originally may have been much longer than it’s present 8m. The width of this boat was just 1m. The boat base was flat on top and gently curved at the base. To get an Oak tree of over 1m. diameter would be rare nowadays. This may be an indication that this boat was carved a long time ago at a time when larger trees were widely available. Large boats are up to 4000 years old! The variety of Oak found here today is Quercus robur with typically straight trunks, unlike the twisted Sessile Irish Oak. Accurate ageing of this boat will need radiocarbon dating. This is planned. How did this boat get here? Possibly it was buried and protected by mud. Then recent storms exposed it? Water level was very low at the time and has not been as low since. The boat remains under water pending lifting, describing, and then reburying near... where it was found. This is one month’s record of our work on Lough Allen in 2015. Other months are Linked at the top of this page.